I could not believe my eyes… A box of Sanctum cards, found by chance in the back room of a second-hand bookshop. So it was true, The Sanctum Society did exist! The whispered rumours of a powerful secret society, hiding behind the cigar smoke in Chicago gambling dens, in seedy rooms above Parisian Brothels, or in the exclusive clubrooms of Mayfair…. it was all true! I had heard that this most secret of groups carried with them a powerful and arcane knowledge, but little did I realise that the simple card I held was a device, a portal to the very heart of Sanctum. Now we are able to offer you one of these exclusive, beautifully perserved and extremely mysterious cards. 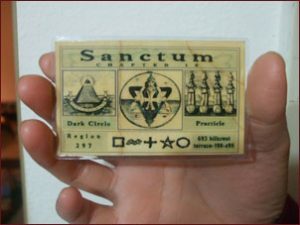 The Sanctum card is now a truly remarkable piece of mentalism. 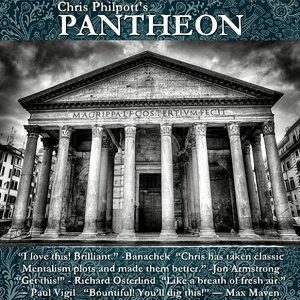 It can be used for a number of quick mysteries, or to give your spectator the power to reveal the contents of a room in memorable detail, a room they’ve never seen before! “The Room” · With the card in your wallet, you have a complete act ready to go. 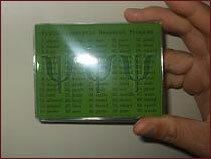 · The card also contains many short one-off routines, if your audience fancy a quickie. · On top of this we have included a selection of high quality bonus routines. 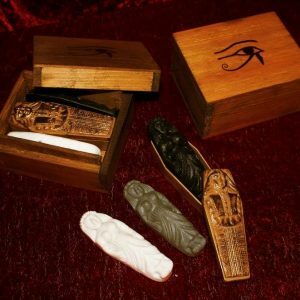 · This is not a trick but a whole concept, a complex world whose mysteries are revealed to you in the comprehensive manuscript.